Customers shop for early Black Friday sales on Nov. 26, 2015, in New York, New York. Retailers appear to have the odds in their favor this holiday season, with record-low unemployment across the U.S., strong consumer confidence and building sales momentum so far in 2018. "We think most retailers will have a good holiday season if they have a distinctive value proposition," Rod Sides, vice chairman of Deloitte's U.S. retail and distribution practice, told CNBC. "We think off-price will continue to do well, and there will be a rebound in luxury." Retail sales are expected to grow between 5 and 5.6 percent from a year ago, according to Deloitte's annual forecast for the holiday season, which was released Wednesday. For comparison, sales between November of last year and January 2018 climbed 5 percent, totaling $1.05 trillion, according to data from the U.S. Commerce Department. 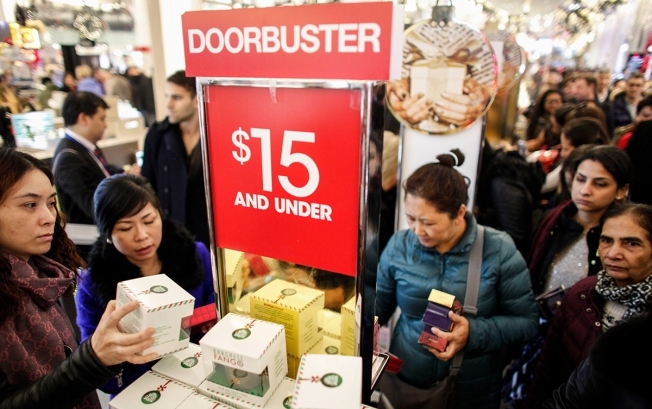 This year, Deloitte says holiday retail sales could top $1.10 trillion. E-commerce sales, meanwhile, are expected to rise as much as 22 percent through the holidays, Deloitte said. That would be higher than the 16.6 percent online retail sales growth from November 2017 to January 2018. Deloitte is predicting e-commerce sales by themselves could reach as much as $134 billion this holiday season, compared with about $110 billion a year ago. But as retailers have adapted to more sales shifting online, companies are less concerned today about whether the sale is being made in a store or on the internet. "Now it's all a battle about share," Sides said. Anyway they can, retailers want to account for a larger share of a shopper's spending during the holidays. So this year, according to Deloitte, customers browsing should expect to see new ways that companies are trying to make either checking out in stores or online faster and more convenient: more buy online, pick up in store options, less screens to click through on a website to confirm a purchase, and more promotions all around. "Companies realize they are fighting for convenience ... at the end of the day they will bring that to shoppers," even if it costs them, Sides said. He expects companies that sell discounted inventory, like TJ Maxx, Burlington and Ross Stores, will continue to have a strong year, as shoppers are still out looking for deals, even when they have more money in their pockets. But when people do decide to splurge this season, that should benefit luxury names like Coach-owner Tapestry, Tiffany and Louis Vuitton-parent company LVMH. Despite the rosy outlook by Deloitte, there are a few factors that could get in the way of the retail industry having a strong end to 2018. That includes: a major correction in the financial markets or increased political unrest, according to Sides. The tariffs situation, which many retailers are thinking about as tensions escalate with China, isn't going to "trickle down" to consumers just yet, he said. "It's not going to have as much of an impact [this holiday season] than you might think." Still, President Donald Trump's plans to impose 10 percent tariffs on $200 billion worth of Chinese imports starting Monday will ultimately impact the retail industry. Those duties will rise to 25 percent on Jan. 1. "Even with the recent announcement even today, we do expect that there will be more tariffs," Macy's CEO Jeff Gennette told CNBC's Courtney Reagan on Monday. "It's going to start to affect a department store retailer more significantly because of the apparel pieces that are going to be part of it." The firm is being "cautiously optimistic" in its forecast, Roshan Varma, a director in AlixPartner's retail practice, told CNBC. "The health of retail is still very strong, but 2017 will be a tough year to follow," Varma said. "Last year was a bit of an anomaly, and we are expecting more of a typical holiday season this year."